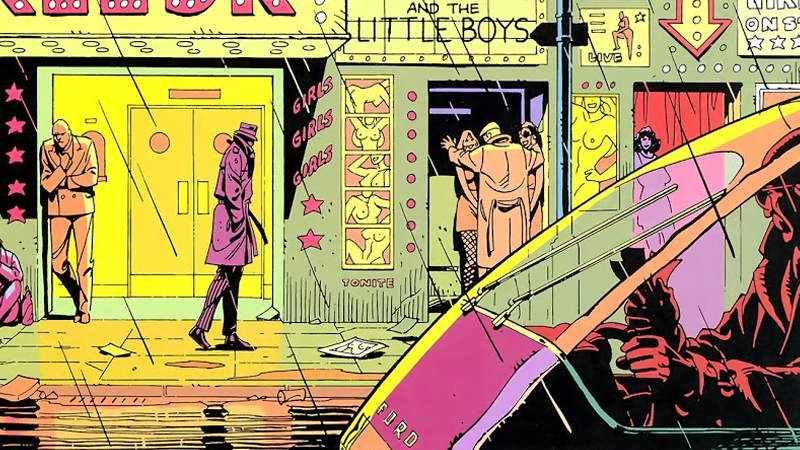 Rorschach treads the streets of New York in the pages of Watchmen #2. Watchmen is heading to television—but in a way you might not expect, according to producer and writer Damon Lindelof. In a new letter to fans, the creator channels some of the series’ most beloved moments to explain what’s in store when it eventually makes its way to HBO. It’s pretty lengthy—there’s multiple pages that you’ll have to head on over to Instagram itself to see, but Lindelof not only makes it clear that he ardently loves Watchmen as a body of work, but firmly believes in Alan Moore’s wishes that the story told in Watchmen is a story that can only be told in the medium of comics. And so, Lindelof’s revelation: The Watchmen TV series won’t actually adapt Watchmen itself. We have no desire to ‘adapt’ the twelve issues Mr. Moore and Mr. Gibbons created thirty years ago. Those issues are sacred ground and will not be retread nor recreated nor reproduced nor rebooted. They will however be remixed. Because the bass lines in those familiar tracks are just too good and we’d be fools not to sample them. Those original twelve issues are our Old Testament. When the New Testament came along it did not erase what came before it. Creation. The Garden of Eden. Abraham and Isaac. The Flood. It all happened. And so it will be with Watchmen. The Comedian died. Dan and Laurie fell in love. Ozymandias saved the world and Dr. Manhattan left it just after blowing Rorschach to pieces in the bitter cold of Antarctica. But we are not making a “sequel” either. This story will be set in the world its creators painstakingly built…but in the tradition of the work that inspired it, this new story must be original. It has to vibrate with the seismic unpredictability of its own tectonic plates. It must ask new questions and explore the world through a fresh lens. Most importantly, it must be contemporary. The Old Testament was specific to the Eighties of Reagan and Thatcher and Gorbachev. Ours needs to resonate with the frequency of Trump and May and Putin and the horse that he rides around on, shirtless. And speaking of Horsemen, The End of the World is off the table… which means the heroes and villains–as if the two are distinguishable–are playing for different stakes entirely. Lindelof’s letter goes on to note that this doesn’t mean Watchmen’s past is off the table for the show—he teases that “a surprising, yet familiar set of eyes” will look back into the costumed history of the Minutemen and the old heroes of Watchmen’s history. But beyond that, it turns out the new Watchmen show is going to be unlike anything we expected out of it. What do you make of these latest updates?